Release 2.1alpha3, 7 December 2007. FreePastry is a modular, open source implementation of the Pastry p2p structured overlay network. No support for ProximityNeighborSelection during booting. Socket will go away. Currently all the old "socket" code is still in the codebase, but it is unused. PastryNode will be "final" Currently, PastryNode is extended to SocketPastryNode, DirectPastryNode (for the simulator), TLPastryNode (for the new features). The plan is to move the features of TLPastryNode into PastryNode and the DirectPastryNode into a layer, then delete all the remaining code. Currently the mechanism to boot a new node is factory.newNode(factory.getNodeHandle()). This has to go away because in the new system, you may need credentials as a PastryNode to communicate with other members of a ring. The factory wouldn't have such credentials, becuase an Id will usually be associated with the credentials. For reverse compatibility, the existing PastryNodeFactories will return a stub NodeHandle that mearly contains the InetSocketAddress. The new way: factory.newNode() will return a new node, but does not cause any network traffic. At this point, you can register applications with FreePastry. pastryNode.boot() will cause the actual bootstrapping process. Proximity Neighbor Selection during boot process. endpoint.route(): returns a rice.p2p.commonapi.MessageReceipt, and can take a rice.p2p.commonapi.DeliveryNotification. MessageReceipt.cancel() can be called if it takes to long to send. The combination of these objects can be used to gain fine grained control of bandwidth usage. You can now determine how many messages are queued up, and cancel messages when needed. The socket is very similar to FreePastry's AppSocket interface. Has notification of messages sent, and socket's opened like the commonAPI. Bug fix in routing -- When you routed to a key that fully matched the id of a node in the network, the routing table repair mechanism would throw a NPE. Bug fix for consistency -- When you called endpoint.route(null,msg,target); this message would still be dropped for possible consistency violations. There is no violation for such a request because it is for a specific node. This required an update to the Binary Format for the RouteMessage (version 1). See the Protocol Specification for the specific change. to force the routing protocol to send version 0 messags until the majority of your ring is properly upgraded. Note that both versions 0 and 1 can still be received, but only version 0 will be sent, even if it receives a version 1 message. Note that you will still be subject to the bug while using version 0. Wireshark dissector. Thanks to David Dugoujon -- see tools/wireshark/ in the source distribution. Numerous Bug Fixes, Performance Optimizations, Documentation improvements. Note:The PeriodicLeafSetProtocol is very low bandwidth and provides routing consistency in almost all situations other than network partitions. However, the accuracy of the LeafSet is most accurate near the center. This is because leafset changes are gossiped. With the default setup, changes to the leafset may take over 4 minutes to propagate to all nodes. However, your nearest neighbor to the left and right are guaranteed to be accurate. Note:The node may go ready and not ready depending on lease validity. Not ready means that the node will not accept routing messages. This is necessary to guarantee routing consistency. To find out if you are ready, you can call PastryNode.isReady(), or register yourself as an Observer of the PastryNode. You can expect a value of true when the node goes ready, and a value of false when it goes not-ready. EpochInetSocketAddress supports a list of IP addresses to work properly with NATs that don't support hairpinning. Elimination of Java Serialization. Is reverse compatible with the code of previous version, but the protocol is not reverse compatible. Your application needs to implement rice.p2p.commonapi.rawserialization.RawMessage to gain the benefits of non-java serialization. Application level sockets. Applications can now use their own socket which will be properly source-routed. This allows applications to handle their own end-to-end communication for large messages and flow control. See rice.tutorial.appsocket for an example of how to use this feature. Application and Endpoint can be registered later to remove implicit registration that caused synchronization bugs during startup. In other words, Node.registerApplication() was replaced with buildEndpoint() and you must call Endpoint.register() after you application has initialized its member variables. Protocol may still change slightly. No documentation or tutorial for how to use Raw Serialization or Application level Sockets. Added GT-ITM topology model. See rice.pastry.dist.GenericNetwork. It takes a file name which is the NxN array of proximities, tab or space delimited. Made liveness checks work via random exponential backoff. Can specify (max is leafset size) the number of Source Routes to use. 24 is probably too many and can lead to congestion collapse. pastry_socket_srm_num_source_route_attempts is the parameter to set. Default is 8. Endpoint.range() now throws a RuntimeException (RangeCannotBeDeterminedException) if it doesn't have enough information to produce the requested range. This is expected to be the last release that uses Java Serialization as the message format. This release is fixes some bugs with the direct simulator. Fixed Environment Constructor in DirectPastryRegrTest and DirectPastryPingTest to use the proper TimeSource for the Direct Simulator. Proximity NPE -- Fixed a bug that was throwing a null pointer exception in DirectNodeHandle.proximity() if DirectPastryNode.receiveMessage() was called outside of MessageDelivery. This was based on a hack to make it so that proximity() worked again, which had been broken for some time. But the hack was not pervasive enough. It should be fine now. SplitStream and Scribe are now Destructable -- Necessary so that when you kill a node in the simulator, these apps give up their observer status on node handles, because they are now dead. This was causing hashtable exceptions. Fixed Environment Constructor in HelloWorld to use the proper TimeSource for the Direct Simulator. This release is primarily performance enhancements and bug fixes. Faster logging -- Made FreePastry faster by hiding log operations behind conditionals. This prevents a lot of unnecessary string garbage from being created when logging is partially or totally turned off. Memory leak -- Fixed a memory leak in the transport layer which caused performance problems by forcing frequent garbage collection. There were 2 WeakHashMaps that didn't always agree, and this was causing lots of objects to move into the tenured status in the generational garbage collector. Also fixed some some long term memory leaks in the transport layer that would have come up if a system was running for a long time in a network with churn. Increased the default number of allowed pastry_socket_scm_max_open_sockets sockets from 40 to 300. This option limits the number of outgoing sockets that Pastry maintains. The main reason to limit this value is to avoid running out of file descriptors. The old value of 40 was causing thrashing in networks larger than 40 nodes. A typical pastry node might be expected to use about 80 sockets: 24 for a leafset, 16 for the first row of the routing table, and some number of active connections to other nodes. However, when a pastry node attempts to open more sockets and is limited there can be a performance problem which is why we set the default so high. If your system runs out of sockets while running pastry try unlimiting the number of file descriptors in the operating system. In Unix-alikes this is often via the shell command "ulimit -n". If this still does not help, or you are unable to unlimit file descriptors, or you need to run many pastry nodes on a single computer, you may need to reduce pastry_socket_scm_max_open_sockets. Note that this option is merely a soft limit which may be temporarily exceeded when sockets are opened to the local pastry node from another node. Fixed direct simulator -- Added a concept of time to the simulator, and fixed the destroy() method to function properly. ScribeRegrTest and SplitStreamRegr test now work with both "direct" and "socket". Temporary fix for "large ring" bug in Past replication. If a ring grows too quickly or two partitioned rings join replication can mistakenly discard data that the local node is no longer responsible for but no other node has yet replicated. The temporary fix is to do a lookup/insert before deleting a key the local node is no longer responsible for. Admittedly this doesn't scale, so we are working on a new solution perhaps using bloom-filters or hash trees. Proximity Neighbor Selection -- Fixed issue with PNS not building up routing tables during join. The getAddress() was not being called at one place in the StandardJoinProtocol so nodes were not updating their routing tables when the JoinRequest was routed through their node. Dropped JoinRequest on rapid rejoin problem -- There was a problem with nodes not being able quickly to rejoin if they used the same NodeId. Didn't find the cause of this bug, but can no longer reproduce. Logging — We have standardize on a logging system throughout FreePastry. This is a simpler logging framework than the one that ships with java, however it is compatable. (In other words, you can implement our LogManager and Logger with the Java one.) This logging replaces the previous "-verbose" etc. logging. Parameters — Formerly hard-coded (public static final) parameters are now able to be specified at startup, or even changed during runtime rather than requiring a re-compile. It allows parameters to be changed from code, and to be persistent. In other words, you could have a gui that lets you change the parameters, then store them to disk (By calling Parameters.store()), so next time the code is run, it retains the parameters. SelectorManager — You can control which nodes use which SelectorManager. The SelectorManager is a single thread that handles all network IO and Timer events. This model usually gives improved performance, and simpler synchronization than several threads. Processor — It is important that tasks done on the SelectorThread don't take long, as this is the network IO thread, and can cause other nodes to suspect you are faulty. However, sometimes you need to do a CPU intensive task (like calculate a manifest for a bloom filter) that will cause problems if done on the SelectorThread. For these tasks, you can use the "Processor. This is simply a different thread that will be context switched automatically by the system. Typically, you will access this by using the Node.process() or Endpoint.process() function call. These calls result in a call to the Processor. Future implementations could use more Threads for computers with several processors, or hyper-threading. TimeSource — FreePastry and its apps now call TimeSource.currentTimeMillis() rather than System.currentTimeMillis(). This will (for example) allow you to run a FreePastry node on a clock that is offset from your computers clock. This can be particularly helpful in a situation like Planetlab where some nodes have incorrect system clocks due to misconfigured NTP servers. RandomSource — Has the same interface as java.util.Random, but Allows for easier reproducability of some errors. You can seed the RandomSource with the same parameter so you can reproduce conditions. A getter and setter for the java primitive types, as well as String, String, InetAddress, InetSocketAddress, and InetSocketAddressAddress. For example pubilc int getInt(String paramName). Calling the wrong type of getter will result in a RuntimeException, such as NumberFormatException. Calling the getter for an entry that doesn't exist will result in a RuntimeException. boolean contains(String paramName) — can check to see if a param exists before calling the getter which will result in an exceptin if it doesn't exist. void remove(String paramName) — removes a param. void store() throws IOException — stores the differences from the defaults to media (such as disk). When you construct the environment (new Environment()) it will use rice.environment.params.simple.SimpleParameters to manage parameters. The Environment constructor with no parameters will look for a file called freepastry.params in the classpath. This file is the default file, and is immutable, thus calling the store() method on the Parameters object will do nothing. The format for freepastry.params is explained here. If you want to specify a file to save dynamic user parameters, or to override the default freepastry parameters, you can specify a single String fileName in the Environment constructor. To override the default params filename, or to use a chain of defaults (for example epost uses a secondary default file to override and add to freepastry's defaults), specify a String of the defaults in order (for example freepastry, then epost), then specify a String for the dynamic user settings. Of course you can use helper methods to reduce typing. The available log levels can be found in the rice.environment.logging.Logger interface, but the match java's log Levels. By default the logging will go to System.out (standard output). To make the logging go elsewhere, construct the environment with a SimpleLogManager that is constructed with a PrintStream that you want (such as System.err, or a File). pastry_factory_multipleNodes — if true, prepends each logged line with the nodeId. This is useful when you have multiple nodes in the same JVM, but want to be able to distinguish which nodes is logging what. environment_logToFile — if true, used in conjunction with pastry_factory_multipleNodes, logs each node to its own file, logging not related to a node goes to Stdout by default (usually stdout). fileLogManager_fileSuffix — allows you to specify the suffix of these files, default is ".log"
The main constructor takes in all 6 services that the environment provides. Any fields that are null will be given an appropriate default value. However, the Parameters field must be non-null to use this constructor. Created non-blocking, continuation based versions of getNodeHandle(), getLeafSet() etc. in the factories. Version 1.4.1 introduces the ConsistentJoinProtocol and some changes to the PeriodicLeafSetProtocol. These improvements provide stronger guarantees regarding routing consistency. Wasn't FreePastry always consistent? What could have caused routing inconsistencies in previous versions? Routing could be inconsistent in FreePastry if at some point there existed two adjacent nodes that are both active and do not know of each other, thus believing that they are responsible for some of the same keyspace. This could temporarily happen during concurrent joins, or if a node incorrectly determined its direct neighbor to be faulty, and therefore took over that section of the keyspace. The result of an inconsistency is that routing to a key (for example a DHT put/get) could cause the message to be delivered to different nodes, depending on the origin of the message. Thus you may do a PUT but then a subsequent GET still retrieves the old value! How does FreePastry prevent routing inconsistency? Our consistent join protocol is similar to that described in Microsoft Technical Report MSR-TR-2003-94, except that it does not require that all nodes are reachable from any other node at all times. The idea is that when a node joins, before it accepts messages, it must first contact its entire leafset and either receive a reply from each member or determine them faulty. This causes concurrent joiners to be aware of each other before both can become active. We rely on dynamic source routing introduced in FreePastry Version 1.4 to ensure that a node is considered alive as long as it is reachable by one of its leafset members. The new protocol also dramatically reduces the overhead of leafset maintenance. By default the system is configured to send and receive a message from each neighbor every 20 seconds, and if it takes more than 30 seconds to hear from a neighbor, then a checkLiveness() starts. This ensures that a portion of ringspace never remains unclaimed for longer than 50 seconds (20 seconds between pings, then 30 seconds to wait for replies) after the death of a node. We ran tests on PlanetLab to characterize the overhead of leafset maintence at various neighbor ping intervals. All of the data for the following graphs were collected on a ring running with no application and induced churn to give an average node lifetime of 60 minutes. This graph represents the fraction of traffic that is due to leafset maintenance. One hundred percent would mean that all overlay traffic was due to leafset maintence. Leafset maintenance amounts to a modest 12.4% of traffic in packets even at a fairly aggressive neighbor ping rate of once every 20 seconds (the default). We expect the overhead as measured in bytes to go down in a future release of FreePastry that uses a binary wire protocol rather than java serialization. 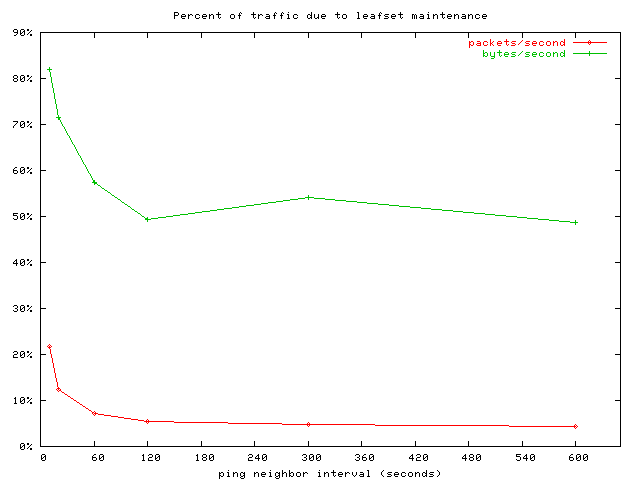 This graph shows the average traffic due to leafset maintenance in bytes per second (smaller numbers are better). The error bars are at one standard deviation among the nodes in the overlay. 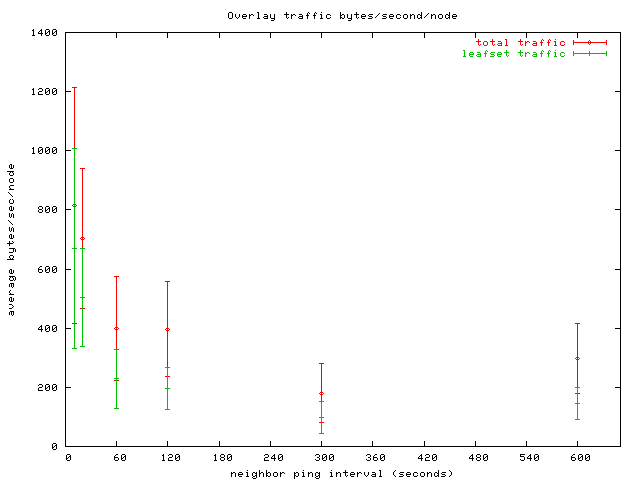 At a 20 second neighbor ping interval leafset maintenance traffic is 71.5% of overlay traffic (top graph) but as this graph shows, that amounts to a data rate of only 500 bytes/second. 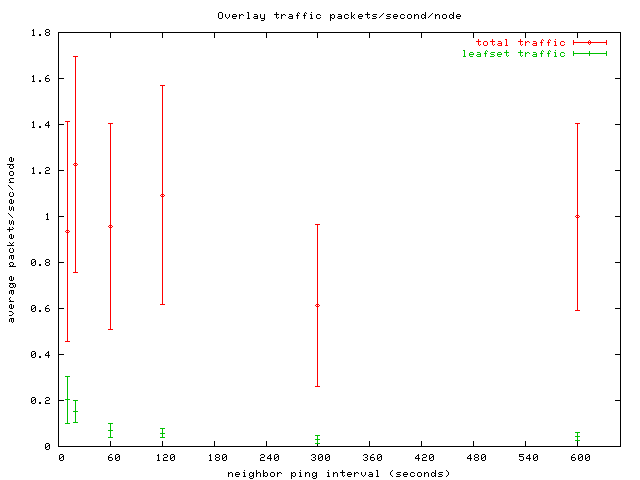 This graph shows the average traffic due to leafset maintenance in packets per second (smaller numbers are better). The error bars are at one standard deviation among the nodes in the overlay. At a 20 second neighbor ping interval, leafset maintence requires about 0.15 packets per second, or about 10 packets per minute. Applications can trade off between the amount of maintence overhead they are willing to tolerate and the length of time they are willing to allow ringspace to be unclaimed by adjusting the neighbor ping interval. When using the rice.pastry.standard.ConsistentJoinProtocol (which is now the default for the SocketPastryNodeFactory) PastryNode.setReady() will not be called until the node receives a ConsistentJoinMsg message from every node in its leafset. Important: If the Pastry selector takes more than 20 seconds (the time it takes rice.pastry.socket to find a node faulty) to select, then it is possible that other nodes will have found the node faulty. A system standby or other type of process pause occurs. Application level code is taking too long to process messages. To prevent inconsistet routing in this case, the ConsistentJoinProtocol will call PastryNode.setReady(false). This will cause your applications to stop receiving messages until the ConsistentJoinProtocol "rejoins" and calls PastryNode.setReady(true) again. By default, your application will not receive any notification of these events! If you wish to hear about such events then register yourself with the PastryNode as an Observer. You will receive a Boolean(true) when the node becomes ready, and a Boolean(false) when not-ready. Note that to keep reverse compatibility with your applications, PastryAppl.notifyReady() will still be called only the first time a node becomes active. In the current version of FreePastry, complete network partitions may lead to routing inconsistency. If a small group of machines loses connectivity to the rest of the overlay, they may detect all other nodes to be faulty and begin accepting messages for larger and larger portions of the key space. The FreePastry team is currently investigating a approaches to deal with such partitions, and we expect a solution in a forthcoming release. We have done extensive routing consistency testing on Planetlab. The only times we find routing inconsistencies is during a network partition (usually the loss of a subnet). Routing in this case is only inconsistent across the partitions. Single threaded: We have adapted a single threaded model to improve performance. Calls into Pastry are still properly synchronized. In fact if you run multiple nodes within the same JVM they will execute on the same thread. The scheduler is implemented in rice.selector. Simplified transport layer. The Socket transport layer uses TCP for all messaging except liveness. Improved liveness checking, better support for churn. The Socket transport layer uses UDP only for liveness checks, and they are sent using random exponential backoff. Improved support for PlanetLab and the Internet. Gracefully handles temporary and permanent routing anomalies by using sourceroutes. The sourceroutes are selected from nodes within the leafset. Improved routing performance. Aggressive routing around nodes that may have stalled. We now use per hop acks to rapidly route around stalled or congested nodes. Support for a fixed file descriptor limit on sockets. This is used for nodes that need to fix the maximum number of concurrently opened sockets. Typically this is used if you don't have sufficient privilege to raise the maximum number of open file descriptors for a process. (See ulimit -n). Support for fine grained prioritization of message delivery. We added int getPriority() to the message interface. The transport will prioritize higher priority messages over low priority. Support for NodeId reuse. Previous versions randomized the last 32 bits of a NodeId. The new version uses an epoch to determine if a node has rebooted since you last talked to it. p2p.commonapi -- Added priority to messages. p2p.past -- Added lease-based past version in p2p.past.gc - extends the PAST interface. p2p.replication -- This has been modified to use bloom filters instead of key lists for replication. p2p.splitstream -- Minor scalability improvements based on planetlab deployment. (NEW) p2p.util -- Various utilities for p2p packages, including Cryptography and XML. (NEW) p2p.multiring -- An implementation of the IPTPS paper, complete with optional RingCertificates. Aggregation: This module can increase the efficiency of a DHT by bundling several small objects into a larger aggregate. It is used by Glacier, but can also be combined with other DHTs such as PAST. Glacier: Distributed storage systems can suffer data loss when a large fraction of the storage nodes fail simultaneously, e.g. during a worm attack. Glacier protects against this by spreading redundant data fragments throughout the system. It can reconstruct the data with high probability even after disastrous failures that may affect 60% of the nodes or more. Please see our NSDI paper on Glacier for a more detailed description. persistence -- Many improvements and bug fixes. Basically the same interface. Should be now *MUCH* more robust. Also added metadata support to the rice.persistence package classes. (NEW) selector -- Allows pastry to run on a single thread. Overhaul of the wire package. The new version is higher performance and has eliminated some known synchronization issues that can cause deadlock. Furthermore the package produces the more sensible NodeIsDeadException if a message is attempted to be sent after the node has simulated being killed. Killing of nodes remains for testing, and is not supported on all platforms. New version of Replication Manager in rice.p2p.replication. Based on commonapi instead of pastry. There is an alternate/simpler interface to rm in the rice.p2p.replication.manager package. Past has been migrated to the new rm (p2p.replication). New version of Scribe implemented on the common API. New version is re-designed to increase the performance, reliability and ease of use. The previous version of Scribe is still include in the release. New version of PAST provides a method to obtain handles to all replicas, and various bug fixes. The old version of PAST that was built on top of the Pastry API is now deprecated. The version built upon the commonApi should now be used. The discovery protocol for automatic location of nearby node given any bootstrap node is now implemented. This is described in the Pastry proximity paper. A prototype implementation of SplitStream, a high bandwidth multicast system,is now released. This implementation does not yet implement all of the optimizations described in the paper; therefore, overheads maybe higher than those reported in the paper. See below for more details about using SplitStream. FreePastry now supports the common API, as described in the IPTPS'03 paper listed above. Newly developed applications should use this API, and only import the p2p.commonapi package. The previous, native FreePastry API continues to be supported for backward compatibility. A more general implementation of the PAST archival storage system was added in this release. The release adds support for replication and caching of data. The implementation provides a generic distributed hash table (DHT) facility, and allows control over the semantics of tuple insertion for a given, application-specific value type. The previous version of PAST has been marked as deprecated and may not be included in future releases. Applications that use Past should migrate to the new version. A version of the replication manager, which provides application-independent management of replicas, is included. Application that need to replicate data on the set of n nodes closest to a given key can use the replication manager in order to perform this task. A simple implementation of the PAST archival storage system was added in this release. The implementation does not currently perform the storage balancing algorithms described in the SOSP paper, nor does it perform data replication or caching. Support for replication and caching will be included in the next release. An anycast primitive was added to the implementation of Scribe, a group communication infrastructure. Also, several methods and new interfaces and a new interface were added to provide apps more control over the construction and maintenance of Scribe trees. Some initial performance work was done. As a result, large simulations run about 50% faster, and use a lot less memory. Release 1.4 has the following limitations. More performance tuning needs to be done. Two "transport protocols" are provided with this release, "Socket", and "Direct". "Direct" emulates a network, allowing many Pastry nodes to execute in one Java VM without a real network. This is very useful for application development and testing. "Socket" uses an event-based implementation based on sockets, and uses the non-blocking NIO support in Java 1.4.2. It uses TCP for all communication except liveness checks which are UDP. This version is much more robust than prior distributions and has been tested extensively on planetlab. On Unix systems, Java's socket implementation uses File Descriptors. In this implementation, the File Descriptors can be used up if too many nodes are running in a single process. We have a soft limit on the number of file descriptors, but we are aware that you can exceed this number under some scenarios. For example if you send messages to to more nodes than you have file descriptors without giving up the thread to allow io. If you require running more than one node inside a single process, consider increasing the number of File Descriptors per process (bash: ulimit -n), or lowering the available sockets per node (rice.pastry.socket.SocketCollectionManager.MAX_OPEN_SOCKETS). The number of allowed sockets is set set by the parameter pastry_socket_scm_max_open_sockets. See parameters for information on how to override the default paramteters. Security support does not exist in this release. Therefore, the software should only be run in trusted environments. Future releases will include security. The Scribe implementation included in this release does not yet support the tree optimization techniques describe in Sections IV, E-F of the Scribe paper. To use the binary distribution, download the pastry jar file and set the Java classpath to include the path of the jar file. This can be done using the "-cp" command line argument, or by setting the CLASSPATH variable in your shell environment. For some applications you may need the 3rd party libraries included with the distribution. These are available in the source distributions. Simply unpack the distribution and include the jars in the lib/ directory in your classpath. To compile the source distribution we have switched to ant for the build process. You will need to have ANT installed (available from http://ant.apache.org/) on your system. Expand the archive (FreePastry-1.4.2-source.tgz or FreePastry-1.4.2-source.zip) into a directory. Execute "ant" in the top level directory (you may have to increase the maximum memory for ant by setting the environment variable ANT_OPTS=-Xmx128m), then change to the "classes" directory to run FreePastry. Without -bootstrap bshost[:bsport], only localhost:p is used for bootstrap. Default verbosity is 8, -verbose is 1, and -silent is 10 (error msgs only). Also prints some interesting transport-level messages. Two machines coordinate to form a Pastry network. on one of the nodes, and removes the stale entries. with a <ctrl-C>, starting another bunch, etc. then go about delivering them. Applications that wish to use the native Pastry API must extend the class rice.pastry.client.PastryAppl. This class implements the Pastry API. Each application consists minimally of an application class that extends rice.pastry.client.PastryAppl, and a driver class that implements main(), creates and initializes one of more nodes, etc. Example applications and drivers can be found in rice.pastry.testing; the Hello World suite (HelloWorldApp.java, HelloWorld.java, DistHelloWorld.java) may be a good starting point. Another sample Pastry application is rice.scribe. Application writers are strongly encouraged to base newly written applications on the new common API. Such applications should import the package rice.p2p.commonapi. Ports p and bsport refer to contact port numbers (default = 5009). In some unix shells, you may need to specify the classpath inside double quotes. This creates a network of n nodes (10 by default), and then runs the Past regression test over these nodes. The FreePastry implementation of SplitStream implements the system described in the SOSP '03 paper. SplitStream.java class provides an interface that can be used by applications to create SplitStream instances. Each SplitStream forest is represented by a channel object (Channel.java), where a channel object encapsulates multiple stripe trees. Each stripe tree for a SplitStream forest is represented by a class (Stripe.java), which handles the data reception and subscription failures. Applications can configure the maximum capacity each channel can accommodate in terms of number of children it is willing to accept. Applications can control total outgoing capacity they are willing to provide by changing the value in ScribeSplitStreamPolicy.java. This creates a network of n nodes (10 by default), and then runs the SplitStream regression test over these nodes.